I was contacted by TidyEmu recently and asked if I would like to test out their products. I have reviewed their products in todays post but the views expressed are completely my own. TidyEmu create a small number of notepads designed to be functional but also to look nice. I was sent an A5 notepad and an A4 notepad to try out. The first thing I noticed when I received my notepads was the colourful design. The design element comes from the different coloured boxes or the haphazard arrangement that doesn’t sacrifice the pads useable space. The boxes or columns on the different notepads have wide lines giving you plenty of room to scribble down your notes. This is a nice touch from a desk notepad where hurried scribble is more likely to appear and not your neat handwriting (see my photo below). The paper quality is really good, it can handle fountain pen and ink, wet liquid ink pens and even a Sharpie pen held up well. What I like about these notepads is I can use any pen and know the paper can take it, theres no smearing and no bleed through. It’s what I want from a desk pad. The reverse side of the A5 notepad - the Sharpie pen shows through but everything else performed well. Normally I am not a notepad user. I always have a notebook with me and anything I need to jot down tends to go in there. I also use a bullet journal which holds all my daily to dos so I wasn’t sure how this notepad would fit. The A5 is by far my favourite. The smaller size means it's not too overpowering on my desk and I prefer the three column design. Each column has a space for a header which I’ve found useful. I’ve been using my A5 notepad to scribble small notes, things that pop into my head, codes I need to remember, product names, prices, people I have to email or ring, anything random like that that doesn’t need to be added into a notebook. I use one of the columns to jot down things I need to do or remember for the day and the other two columns are then used for random scribble. This has worked really well and I have been using around one sheet per day. I found the A4 notepad harder to use partly because of the size but also due to the design. This notepad has a haphazard box design with an array of vertical and horizontal boxes of varying sizes. There are seven boxes on the A4 pad so my first attempt at using this was for meal planning. The different size boxes meant that on some days I ran out of space so I quickly scrapped that idea. I then tried using this as a desk notepad but I found the A4 size too big. The grid layout means the notepad is designed to be used in portrait which is a little limiting. If this had a dot or graph grid then perhaps I could have found different ways to use it. I have really appreciated using these notepads. The designs are vibrant and fun and the paper quality is very good. 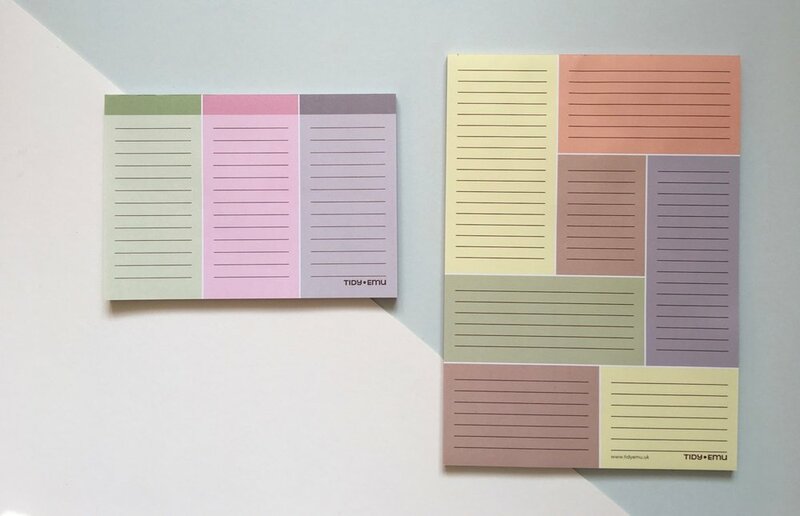 I’d love to see some other colour options in muted tones and perhaps a traditional desk pad size but overall these notepads are pretty damn good.